Suitable for all brass companion flange applications. No cracking or warping due to overheating, or cooling too rapidly. Heating and cooling time reduced. Adjustable rotating flange, eliminating 2 holing. Save money on gases and solder. Copper component is 99.9% copper eliminating any lead issues. Burst pressure for 2″ – 6″ is 1000PSI. Tested. Temperature range is -66F to 272F. Applications include all butterfly and flanged gate valve installations, along with pumps, boilers, chillers, backflow devices. No extra costs. Such as dielectric insulators. Available in 150LB, 300LB, and rolled groove. 100% Electrolysis Protection with copper to steel, cast connection (a suitable isolating gasket must be used). 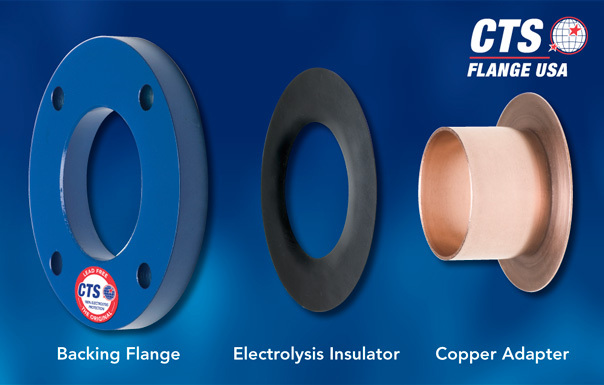 The fast and easy way to connect copper tube to flanged valves & equipment. The backing flange rotates after brazing/soldering is completed. As easy as bend or tee to connect. No bolt insulation kits required.